Collecting pitchers is always risky in the hobby if you're looking to turn a profit. A quick injury or a bad season can kill pretty much any possibility of long-term value. With that in mind, prices are usually much more reasonable than a lot of young sluggers. Case in point are Sonny Gray rookie cards and other early prospect cards. The pitcher has looked good in the early part of his career with some flashes that he could develop into one of the game's best. However, Gray plays for the Oakland Athletics, a team that doesn't get a lot of hobby attention even when they make the postseason. 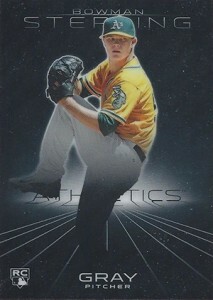 Sonny Gray rookie cards are found in a handful of late-season 2013 products. However, his first cards date all the way back to 2009 when he was playing for the US national team. Upper Deck included him in a couple of their final sets with the USA Baseball license. Among them are several affordable autographs and autographed memorabilia cards. Topps picked up the license starting in 2010, adding even more early cards. 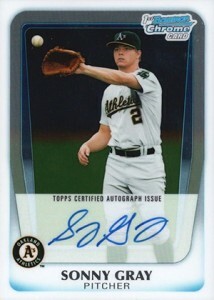 However, the top Sonny Gray card that's available on a wide basis is his 2011 Bowman Chrome Draft autograph. This is his first major card where he's shown in an Athletics uniform. Panini and Leaf also released Sonny Gray cards in 2011 following the draft, however these don't have MLB uniforms or marks. Gray's talents are still emerging. That combined with the ever-risky nature of collecting pitchers has kept prices reasonable for virtually all of the Sonny Gray rookie cards and other early prospect cards. Below is a list of his rookie cards that can be found in 2013 base sets. We've also included lists of key USA Baseball and other important prospect cards. SONNY GRAY 2017 DK SIGNATURES HOLO GOLD DUAL PATCH 10 10! FREE SHIP! ATHLETICS! SONNY GRAY 2011 BOWMAN CHROME REFRACTOR AUTO #119 500 ROOKIE CARD RC A's YANKS? ?